If you’re serious about shaping up for summer this year, then you’ll need to take your diet and your exercise extremely seriously. Every day, more and more people, young and old, are heading to the gym in order to lift weights, build muscle, lose fat, and improve their physiques. Once you have a solid diet and training routine in place, you can next begin to think about supplementation. When it comes to building muscle, protein supplements are absolutely ideal, and are the most popular form of supplement in the world. Protein is essential for the growth and repair of muscles, and muscle tissue, so it’s no wonder that so many people are using protein supplements. As far as protein supplements go however, there are many different varieties, each one offering their own unique advantages and nutritional info. Here are three of the most common and popular. Whey protein concentrate is derived from milk, and is actually a by-product produced when milk is turned into cheese. Now, whey protein is available in concentrate, and isolate. Typically, whey protein is created when all other non-protein elements of the food are removed, Leaving you with just the whey protein. Normally with whey protein concentrate, you’re left with around 70 – 85% pure protein, with what is left being made up of fat and carbohydrates. Whey protein isolate however, is much purer, up to 95% pure in fact. Whey protein isolate is more expensive than concentrate, but both are extremely effective at helping the body to build muscle and repair itself following strenuous activity. 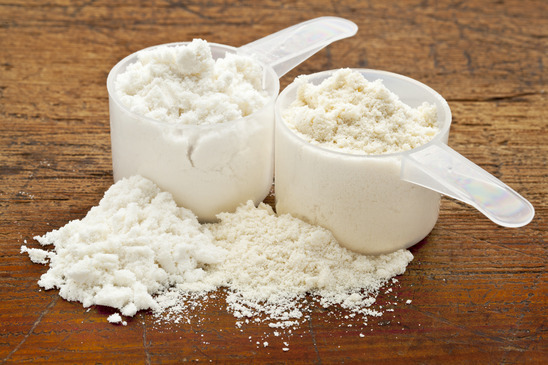 Whey protein is a fast absorbing protein, especially when mixed with water, making it an ideal post-workout supplement. Casein protein is another protein that is actually derived from milk. Casein protein is very similar to whey protein, as they’re both derived from milk, and they’re also both available in concentrate and isolate forms. The only major difference is that casein protein is absorbed much slower than whey protein, because it will take so long to digest. For that reason, many bodybuilders or people looking to build muscle, will drink a casein protein shake just before bed, as it will release a steady flow of nutrients into the body whilst they sleep, preventing the body from jumping into a catabolic (muscle burning) state. As the name suggests, soy protein is derived from soy beans as opposed to milk, and what makes soy protein especially unique, is the fact that soy beans are actually one of the very few sources of plant based protein, that provide all of the essential amino acids that the body requires. It’s also ideal for vegans and vegetarians as well. Soy protein often doesn’t taste as nice as some of the other protein supplements on the market, and pound for pound, it doesn’t contain as much protein as whey or casein, but even so, for vegetarian and vegan bodybuilders and gym goers especially, soy protein is extremely useful indeed. unflavored ones are so hard to swallow.